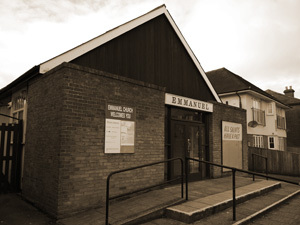 In the late 1940's, a group of believers met together in Shirley, in a Second World War Nissan Hut, and were known as 'The Evangelical Free Church.' The building was regarded as a temporary structure, and at the beginning of the 1950's the Southampton Council served them notice to vacate the premises, as they wanted the land to build a much-needed housing estate. At that time, the church had nowhere to relocate to, and so it became a matter of prayer. Fortunately, the Council were very patient, as imposed eviction dates came and went, but after about two years, one of the Elders of the church had a chance conversation with a neighbour and Trustee of Emmanuel Church. The number of believers at Emmanuel were dwindling, and so the Leadership there were looking at various options. God miraculously answered prayer in a way that was totally unexpected. Many changes have taken place, to both the building and the membership here since that time, but God has always remained faithful.